Team Husqvarna pulled up to the startline of the 2019 Dakar Rally full of optimism and confidence. The two rider team comprised of Chilean rally star Pablo Quintanilla and the inexperienced American standout, Andrew Short. 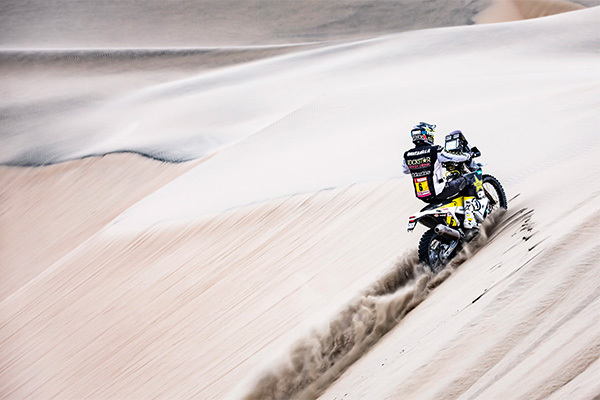 After 10 stages of gruelling racing across some of Peru’s most ruthless desert terrain, Quintanilla and Short claimed 4th and 5th place respectively. Although, if it wasn’t for a major crash 25 kms into the final special stage, Quintanilla could’ve been celebrating the overall victory. Quintanilla had been the stand out rider for 9 of the 10 stages, eating up the Peruvian desert and taking a commanding lead over eventual winner Toby Price (KTM). But a heavy crash early in the final stage left Quintanilla with a painful foot injury that hindered his ability to ride with the aggression and speed it takes to win the Dakar.